I've been planning this post for ages now.. first of all it took me ages to take all the pics.. then I had to trim and edit them.. Then I wanted to put them together in collage type things and it has taken ages! I uploaded them a couple of days ago on here as a draft, and now I am going to finally add text and publish! 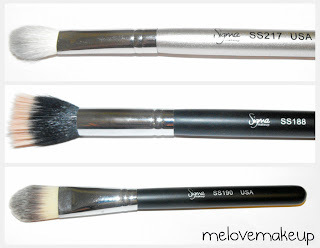 So, here they are in all their beautiful glory.. My Sigma brushes! I was extremely fortunate to be sent these by a wonderful friend of mine, Becky (aka Sirvinya) - THANK YOU Becky! You know I love you because I think I have told you over a thousand times recently, but I seriously appreciate these babies, and I love them so much! OK, So as you can see above, I have the full eye and face set, and then some extras too.. Now, I am gonna run through them all briefly so you can see them, and hear what I think.. I have been using them for a couple of weeks now, and loved them from day one, They are awesomeness! 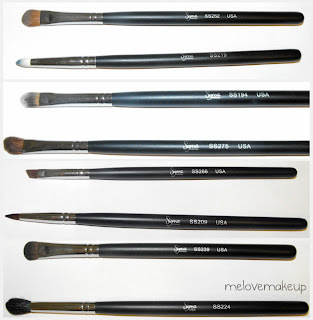 So as you can see and are probably aware, they are all similar to the MAC brush numbers and a similar brush too.. So, the SS168 is gorgeously soft and a little larger than the MAC 168, but it works great for blush and contouring. The SS109, now this one is my fave brush, omg! I love this, it is amazing for blusher, contouring and foundation, I LOVE it for foundation! It is so soft and dense and this brush is my LOVE! The SS187.. Fabulouso! I only own the GOSH Stippling brush, which is alright, but not fantastic! I had always heard how amazing the MAC one was, but could never afford it, but I have read and seen videos where people say that they prefer this to the MAC! I can't comment, but I love it compared to the GOSH one, this is big and well packed and so so soft and gives an amazing flawless finish for blushers and foundations too. 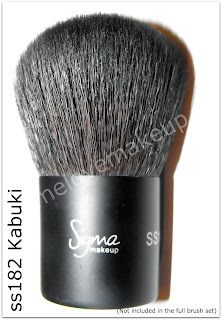 The SS217, this is an extra brush and has a small handle as it is a mini. I really like it though, it looks extremely similar to the MAC 217 but it does have alot more give, It's not as well packed and therefor not as stiff and kind of flops about a bit as you use it.. It's not a write off though and I still love it for crease work, blending and applying colour all over the eyelid too. It's just not AS good as the Mac version I don't think. The SS188, I think this little stippler is fab! I love it for cream highlighters on the cheekbone and also for blusher too, It is soft and dense, like a smaller SS187! 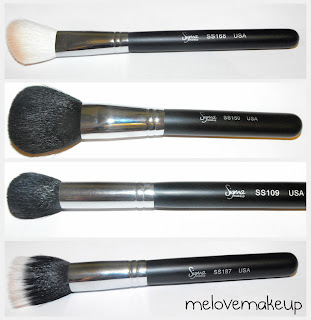 The SS190 is a lovely brush, I know lots of people do not like the traditional style foundation brush, but I do. I would rather use this than a #187, It just suits me better. I had wanted the MAC 190 for ages, but never got it, So I am so pleased to have this, it is lovely and soft, but has the stiffness that a foundation brush needs to have, It applies products so nicely and I loves it! Now for the main eye brushes in the kit.. The SS252 is a stiff yet soft synthetic brush, it is great for applying cream products to the eyes, or paint pots and wet pigments too. Can also be used as an all over shadow brush if you wish, I like this and it's a useful brush to have. The SS219 is nice, but as with the SS217 it doesn't have much of a backbone, it's very soft and when you use it it's slightly floppy, however I think it is good for detailed crease/outer v work and can be used to smoke out eyeshadow under the eyes, it's a good brush to have and is super soft. The SS194 is basically a baby 190, for use with concealer. I normally use my fingers for concealer because it warms it up so that it blends easier, but I did try this and it worked nicely too, it is stiff and the bristles are soft. This could be used for eyeshadow too, if you wanted. 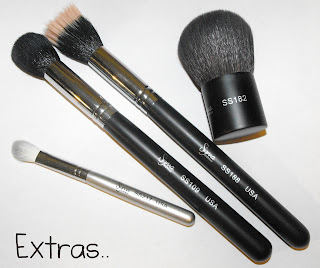 The SS275 brush is a soft angled brush.. I was unsure of what I would do with this, but I actually first tried it in the crease, and because it's not a very wide brush it actually gave quite a nice defined line, and when turned on it's side it blends nicely too. It also works nicely on the browbone. This is the only brush that has shed for me in this set, has anyone else found that? The SS266 is an angled liner brush, quite thin and stiff with a sharp angle, I haven't tried it for eyeliner, but I love it for my eyebrows. The stiffness works well for precision and definition. Great little brush! The SS209 can be used to gel eyeliner, or lips (or anywhere else if you choose). This is the only brush I have not used yet, It's thin, but not overly so.. Some may say it's too thick for gel liner, but it would make a great lip brush, for lining and filling them in. Ahh, The SS239. I have wanted the MAC one for ages, and I know this is slightly bigger, but I love it, So dense and so so soft, picks up colours great and applies them really nicely all over the eyelid! This for me is a great must have eyeshadow brush. So, last but not least eh! The SS182, this is like a soft dream, it feels UhMaZing on the face, distributes colour well, I used it for mineral foundation, or just powdering all over and buffing it in. It feels so silky on the skin and it so dense. I love it! I have been looking for a kabuki like this for ages! ... Woo! All done! Are you still awake? *poke* That was long! I hope I haven't bored you too much. So there they are, the fabulous Sigma brushes, I love them all and I am treating them with the love and care they deserve, they always go back into their roll when I am done with them, and they get regular baths. I haven't experienced any shedding really (Apart from the 275 as I mentioned) and they are all super soft and work well. I don't use many brushes on my face, so it'll be exciting to find out what difference they make! I too was looking at these brushes a few days ago, its just the cost of it all in thats putting me off (I need a lottery win! ), incl the customs charges - Im sure my parcel wouldnt slip through the net knowing my luck! Wow! This is a very thorough review! I'm so glad you are loving the brushes and no one was as deserving as you to get them.